Need a fun project to do with the kids? 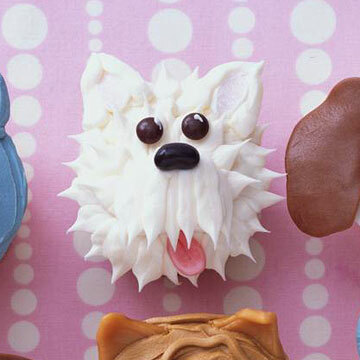 Spend an afternoon creating these playful puppy cupcakes. These ingredients will make multiples of each breed; repeat directions for each variety, working in batches to save time. Since many candies come in bags, you will need only one package of each. 1. Cut 1/2-inch crosswise slice off a marshmallow and cut 1/4-inch slice from one edge. 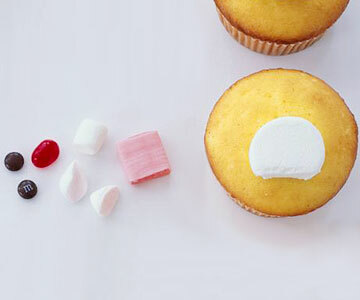 Arrange the marshmallow on lower third of the cupcake, with cut edge closest to cake edge. 2. Cut mini marshmallow in half on the diagonal. Press cut sides into pink sugar to coat for ears. Cut a strawberry fruit chew into quarters. Form 1 piece into a teardrop shape for the tongue. Press a knife onto the center of it to create a crease, and pinch one end. 3. 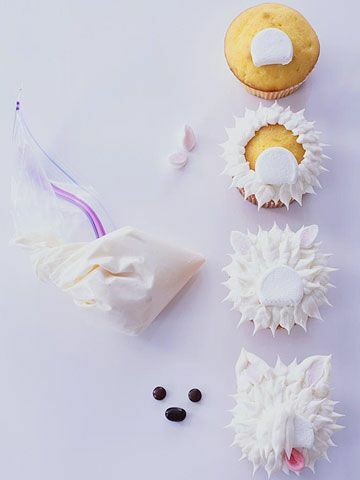 Spoon vanilla frosting into a resealable bag; snip a 1/4-inch corner from bag. Starting along the outside edge, pipe a row of fur frosting. Add the ears. Pipe more fur to cover cupcake and muzzle. 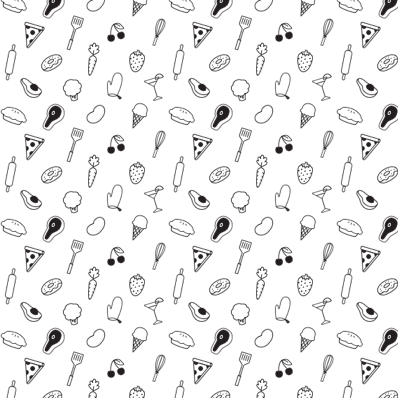 Add the tongue. Pipe an outline of frosting around the ears. Pipe smaller lines on muzzle, being careful not to cover tongue. Add two mini candies for eyes, and a black jelly bean for the nose. Pipe a small frosting highlight on each eye. 1. Tint 1/2 cup of the vanilla frosting golden-brown with the yellow and brown food coloring. Spoon half of the golden-brown frosting into a resealable bag and close. Cut a marshmallow in half crosswise. Microwave two caramels on high for 2 to 3 seconds to soften, then knead them together to blend slightly. Roll out the caramel mixture on wax paper to 1/8-inch thickness. Using scissors, cut out 2 small triangular ears from caramel sheet, and make the chin and the muzzle. 2. Spread a cupcake with a thin layer of golden-brown frosting. Press 1 marshmallow half into the frosting on the lower half of the cupcake. 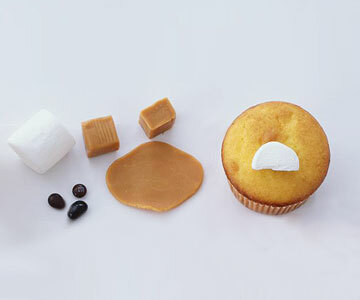 Place the caramel chin over the bottom half of the marshmallow. Drape the caramel muzzle piece over the top half of the marshmallow. Bend the ears slightly; insert into top of cupcake. 3. Pipe 2 dots of vanilla frosting for the eyes; add the mini candies. Pipe a white highlight on each eye. Pipe teeth with vanilla frosting. Place a black jelly bean atop a dab of frosting for the nose. 1. Make ears as for Westie (step 2). 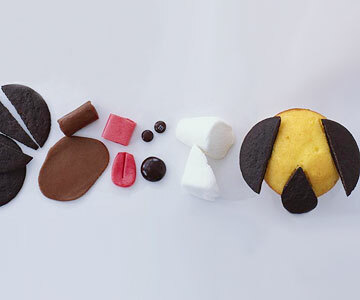 Cut a 1/4-inch crosswise slice from the end of a marshmallow. Trim a 1/4-inch-wide slice off the rounded side. Tint 1/2 cup of the vanilla frosting blue. Spread top of cupcake with a layer of blue frosting. Spoon remaining blue frosting into bag; snip off corner. 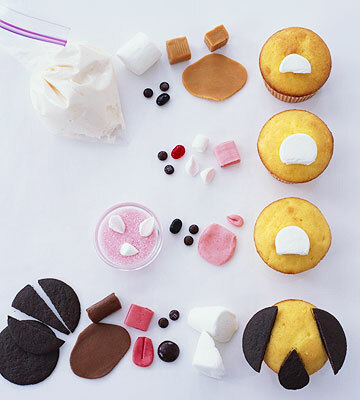 Place the marshmallow muzzle on the cupcake, straight side closest to the edge. 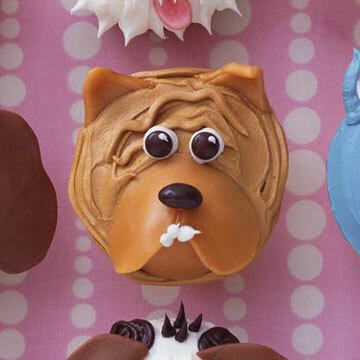 Arrange ears at top edge of cupcake. Cut cherry fruit chew for a tongue as in the Westie (step 2). 2. 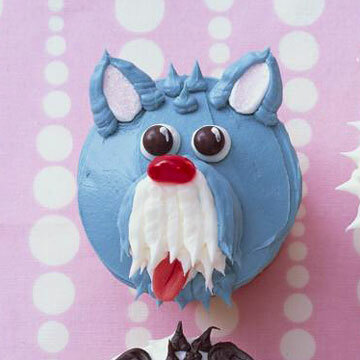 With blue frosting, pipe 2 overlapping rows of small spikes radiating outward on the edge of the cupcake just below the marshmallow, and pipe blue onto sides of muzzle. Pipe vanilla frosting in vertical lines on top of the marshmallow, and onto flat side of marshmallow. Pipe a few blue lines around the edges of the ears and a couple tufts of hair on top. Pipe 2 dots of vanilla frosting for the eyes and add two mini candies. Pipe a highlight on each eye. Add a red jelly bean nose and the tongue. 1. Using a serrated knife, cut cookies to make the ear and mouth supports (see next slide). Cut a marshmallow in half on the diagonal. For tongue, flatten the cherry fruit chew, then roll slightly, to thinner consistency. Cut into rounded shape on one end. Press a knife in the center of it to form a crease. Soften two chocolate taffy candies in microwave on high for 2 to 3 seconds, then flatten each piece on wax paper with a rolling pin and cut out oval or teardrop-shaped ears large enough to cover cookie supports. 2. Spread cupcake top with vanilla frosting. 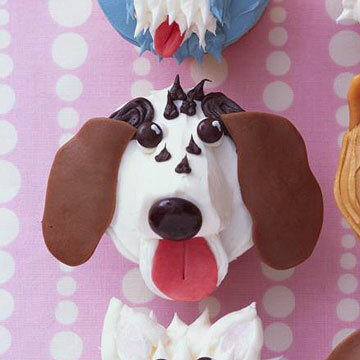 Arrange cookie supports for ears and mouth on top of cupcake. 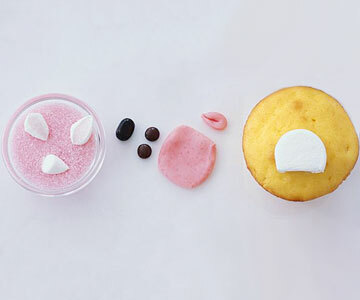 Place 1 marshmallow half in center of cupcake, large end overlapping the mouth. 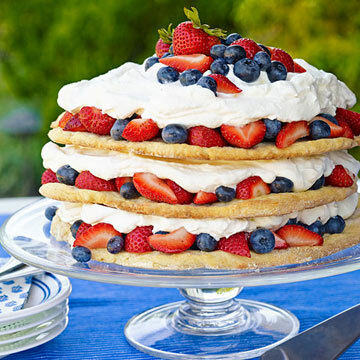 Spread a thin layer of vanilla frosting on top of the marshmallow and the mouth to cover. Press tongue into frosting on the mouth. Add the chocolate-covered mint to the large end of the marshmallow, just above the tongue, for the nose. 3. Place chocolate frosting in a plastic bag; snip off corner. Pipe freckles on the nose, markings around ears and spikes of hair at the top of the head. Pipe a small spot on each cookie ear support and add the chocolate taffy ears. Pipe 2 dots of vanilla frosting for the eyes and add two brown mini candies. Pipe a small white highlight on each eye. Reprinted from Hello, Cupcake! Irresistibly Playful Creations Anyone Can Make, by Karen Tack and Alan Richardson. Copyright &copy 2008 Karen Tack and Alan Richardson. Used by permission of Houghton Mifflin Harcourt Publishing Company. All rights reserved. Originally published in the April 1, 2008 issue of Family Circle magazine.